Orange comes with its own data format, but can also handle native Excel, comma- or tab-delimited data files. 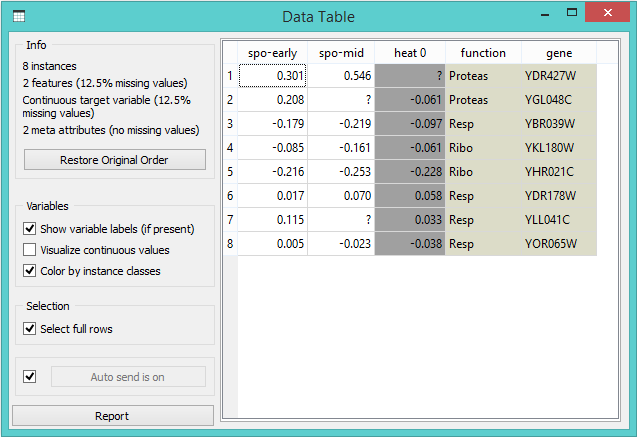 The input data set is usually a table, with data instances (samples) in rows and data attributes in columns. Attributes can be of different types (numeric, categorical, datetime, and text) and have assigned roles (input features, meta attributes, and class). Data attribute type and role can be provided in the data table header. They can also be changed in the File widget, while data role can also be modified with Select Columns widget. Orange can import any comma- or tab-delimited data file, or Excel’s native files or Google Sheets document. 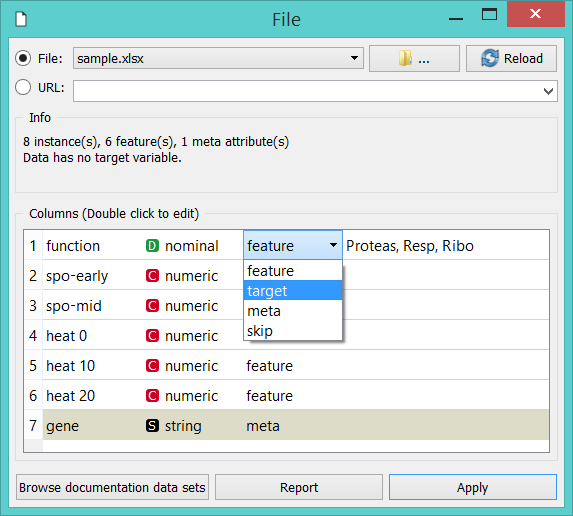 Use File widget to load the data and, if needed, define the class and meta attributes. 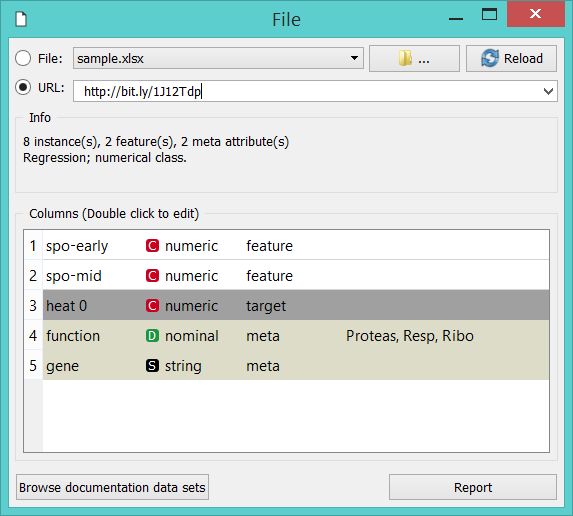 Types and roles can be set in the File widget. Attribute names in the column header can be preceded with a label followed by a hash. Use c for class and m for meta attribute, i to ignore a column, w for weights column, and C, D, T, S for continuous, discrete, time, and string attribute types. Examples: C#mph, mS#name, i#dummy. An alternative to the hash notation is Orange’s native format with three header rows: the first with attribute names, the second specifying the type (continuous, discrete, time, or string), and the third proving information on the attribute role (class, meta, weight or ignore). 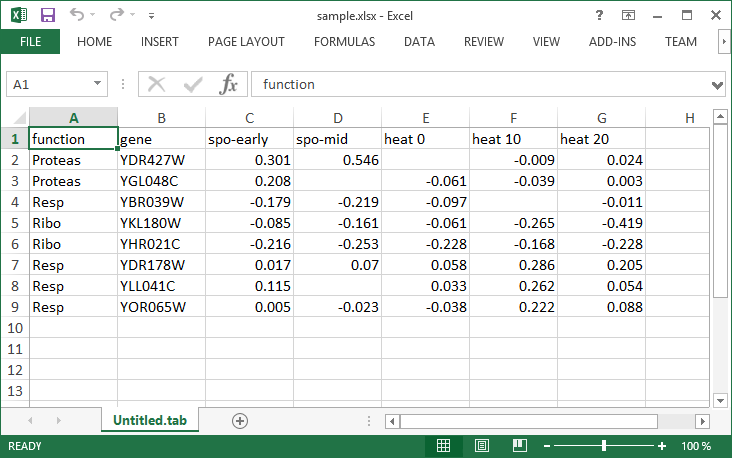 The file contains a header row, eight data instances (rows) and seven data attributes (columns). 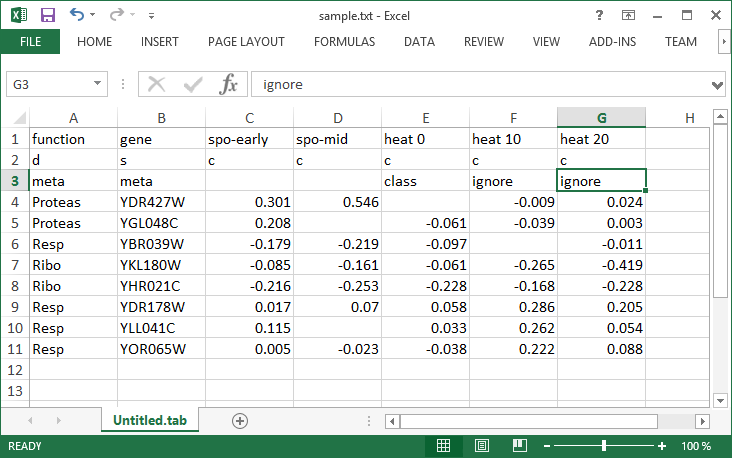 Empty cells in the table denote missing data entries. Rows represent genes; their function (class) is provided in the first column and their name in the second. The remaining columns store measurements that characterize each gene. With this data, we could, say, develop a classifier that would predict gene function from its characteristic measurements. 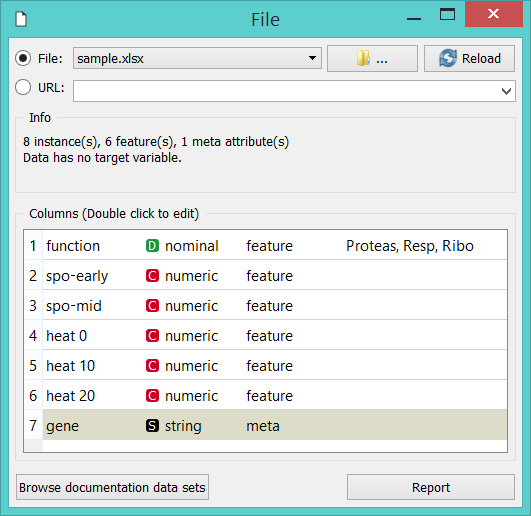 Orange correctly assumed that a column with gene names is meta information, which is displayed in the Data Table in columns shaded with light-brown. 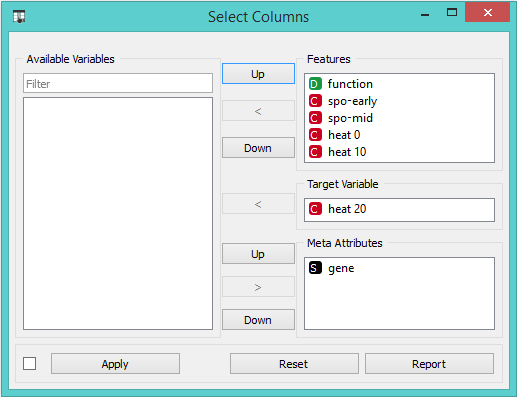 It has not guessed that function, the first non-meta column in our data file, is a class column. To correct this in Orange, we can adjust attribute role in the column display of File widget (below). 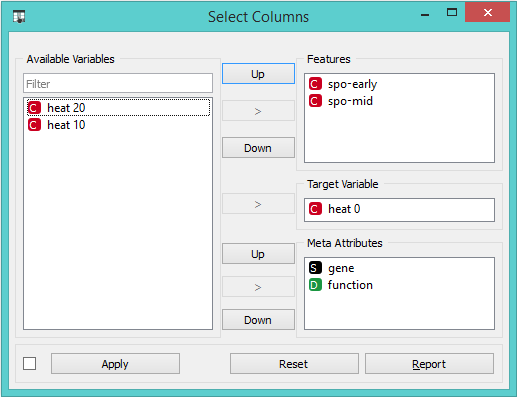 Double-click the feature label in the function row and select target instead. This will set function attribute as our target (class) variable. You can also change attribute type from nominal to numeric, from string to datetime, and so on. 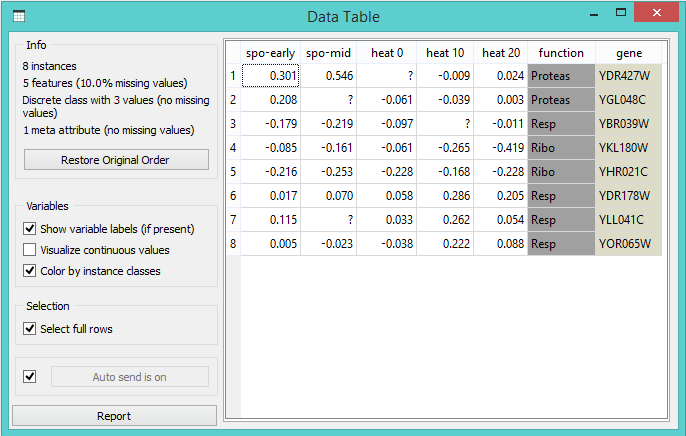 Naturally, data values have to suit the specified attribute type. Datetime accepts only values in ISO 8601 format, e.g. 2016-01-01 16:16:01. Orange would also assume the attribute is numeric if it has several different values, else it would be considered nominal. All other types are considered strings and are as such automatically categorized as meta attributes. Change of attribute roles and types should be confirmed by clicking the Apply button. 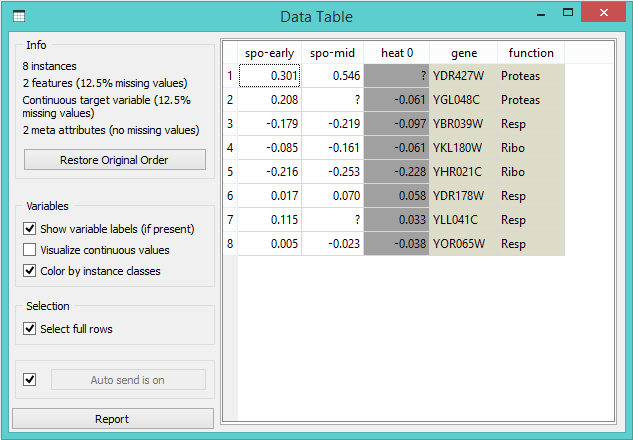 Notice that the attributes we have ignored (label “i” in the attribute name) are not present in the dataset. If you are using LibreOffice, simply save your files in Excel (.xlsx) format (available from the drop-down menu under Save As Type).